Also called "Love Beans", as they are reputed to make your desires in romantic love come to fruition. They are often carried in an odd number in a red flannel mojo. This oil is designed to bring your true desires and ultimate goals a reality for your romantic realtionship or for a romance you hope to ignite! Use on pink figure candle to target a specific person, use on a figure candle matching your gender to draw new love opportunities, use on a marriage candle for a proposal and wear as a perfume to entice your desires to meet you in reality! 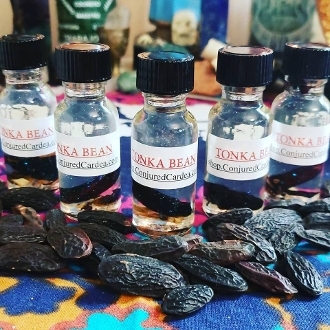 Use along with my Tonka Mojo listing; Make one wish for love on each bean as you place it in the red mojo and carry it for seven days. On the seventh day, throw the beans into living water (a lake, river, sea or ocean) and do not look back.